The results of our online survey have been tallied and your voice is being heard! Each year, Alliance surveys its membership and our management team and board of directors use the results and member feedback to decide on service improvements, future product offerings, facility needs, etc. This year’s online survey had a 15% response rate and was completed by nearly 1,700 members. We appreciate our members’ vote of confidence evidenced by this year’s survey. For example, 95% were “satisfied” or “very satisfied” with our services and 89% said they would likely recommend us to their friends and family members. 53% of respondents stated that they have downloaded our free mobile app and 55% were aware that Alliance offered shared branching. Thanks to all the members who took the time to complete our annual survey. We are a member-owned, not-for-profit financial cooperative and your opinion counts. Alliance Credit Union listens to our members- not stockholders! 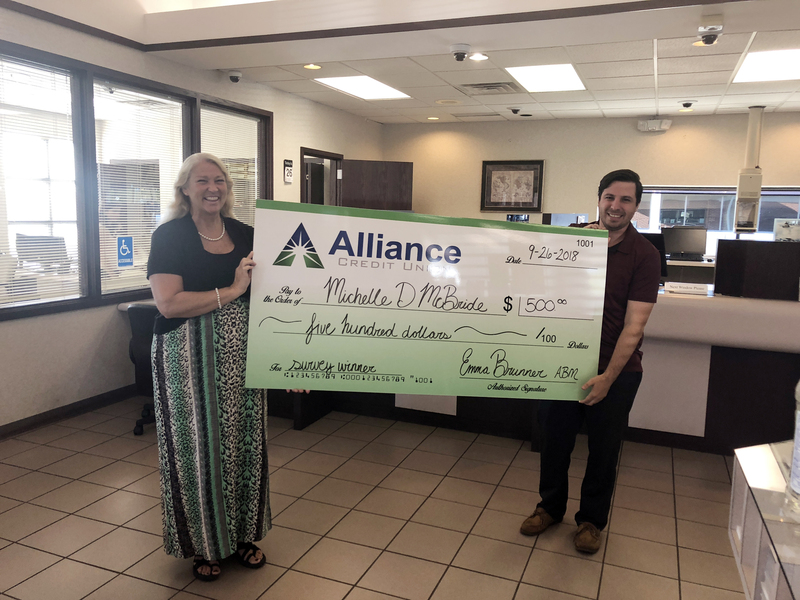 Michelle D. McBride of O’Fallon is handed a $500 check for taking our survey by Assistant Branch Manager Jamie Beckham.